I should have done this when I first joined the group but, oh well, better sooner than much later! I've been a Pokemon fan ever since Generation 1 and have quite the fond set of memories. My collection isn't that large, but it was at some point. I will be sure to upload pictures of it much later on. My main search is towards Entei, Zekrom, and Charmeleon merchandise. Or anything that strikes my fancy. At this current time, Entei is my favourite Pokemon. I also play the Pokemon TCG and Video Games non-competitively. So I do at times look for the oddest cards in some people's eyes, but to me they're something that has potential- or I just love the art. That's another thing about me, I love drawing, comic art, and all that cartooning jazz. I even go as far as to making custom pokemon cards at times~! hmm.... I don't know much of what else to say other than my non-pokemon interests consist of: Digimon, Sonic, Disney, and Dragons overall. Hi Pokémon Collectors! If anyone remembers my last post, you may know that myself and my partner of 4 years, Yelsha42, have moved in together. You also would have read that our combined Pokémon collection took up an entire room in our new house. Alright, so that’s our sob story, let’s cut to the chase! Click HERE to go to my eBay page! I’ll be putting up more auctions over the next few months, so bookmark it! Also feel free to GA any of these lots. March has been a wet month for us Californians, but that does not stop me from doing an outdoor photoshoot! Hi guys, just made a picture of some of my highly wants just in case someone has spare of this or plans on selling them. We can both agree and negotiate for the price so don't worry about that. So basically for the Zukans, I don't really care if they come without the bases or pegs. So it would be Giratina, Blaziken Movie set, Charizard, Togekiss, Salamence, Latios (I don't care if it comes without Latias), Kingdra, Garchomp, Metagross (it can be either the one from the movie set or the regular one, and don't care if it comes without Metang and Beldum) and both Milotics (this one is also fine if it doesn't comes with Feebas). And Latios/Latias movie set figures. Then for the Tomy, the Blaziken I'm looking for is the Clear version, the rest are easy to identify. For the ThinkChips just Venasuar and Groudon. Charizard American figure, Deluxe from the Battle Frontier series, makes sounds. The TFG, Red, Misty, Brock, Blue Landon, Latios, Charizard, and the Kayodo Latios figure. Next the rare gasahpon figures: those 3 Blaziken, Latios Battle gashapon, and Milotic from that set. And finally, it's almost impossible, but just in case, Sir Aarons electronic staff. Quick zukan and others sales! Click here to be transported to sales info&details! 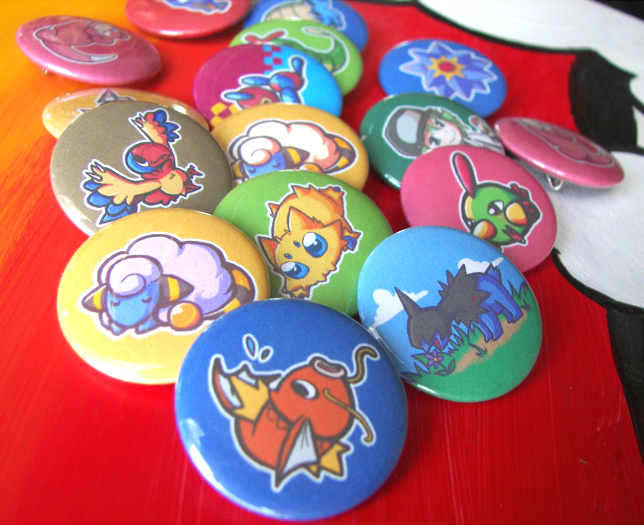 Please have a look inside if you're interested in some buttons like these! Thanks in advance, everybody! I'm sad I haven't been able to be active in what feels like forever, but I do actually have a collection update to do when I get a chance...~ hee hee. Nobunaga Postcard GB - All shipped. P.S. Munna + Garasha card is still available. If anyone is interested, it will be $4.50 for participants and $6.90 for outsiders. Korean Pokéballs and updated sales! I got a nice package the other day containing Korean Pokéballs from gleameyesluxray! 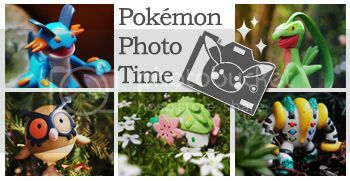 The contents of the Pokéballs are erasers and stickers that have been added to my sales post. I just wanted the Pokéballs for my cosplay, so I'm selling off the contents! I made a quick video on my phone of me opening them and showing off the goods. Click here or the image to go to my sales! Well an unexpected hospital trip has kinda put the Kibosh on most things I was doing today. However I'm back in time to tell you we won the WHOAMG ASH IS A GIANT Group Auction. Hooray! When the middleman updates, I'll be collecting Payment 1. I'm happy to finally get Team Rocket kids! Speaking of Rockets, a couple of weeks ago, I snagged this weird little auction on eBay for 30 pence; thinking they were bootleg items. Once they arrived, it seems they're possibly real licensed clips! They are stamped on the back, and are surprisingly well made. Anyone got more of these? They are really nicely made, and I like them a lot. Speaking of kids, I now have lots of Pikachu! I don't collect them, but I now have so many that I want to complete the set. Sell or trade me the missing Pikachus so I can finally be at peace! :( Colour variants not needed. Hi there, fellow collectors! Here's my collection update after quite a long time (five months, to be exact). Once again, I'm really grateful for all these Raichu things I've got thanks to YOU! I hope you're all doing fine and have had as good a luck with finding new additions to your collections. Hi everyone! So, my mom is currently going out for disability due to her illness and with my father on disability and myself unable to walk or stand for very long, I thought I'd take a few commissions to help out. Now, I know I have let a few members of this community down with having to refund or taking longer than expected in the past. However, I am in a much better mental state now then I was back then. Still, I can understand any wariness on the communities part, so for now, my policy has changed to benefit the buyer. For my first few rounds, payment is not expected until AFTER the stamp is finished. Hi, everyone! I don't usually make wants posts, but right now I'm looking for the type focus photo albums. Specifically, the grass/bug and fire/electric ones. A friend was supposed to pick them up for me but they said it was sold out when they went to the pokemon center in Japan. Can anyone confirm this? 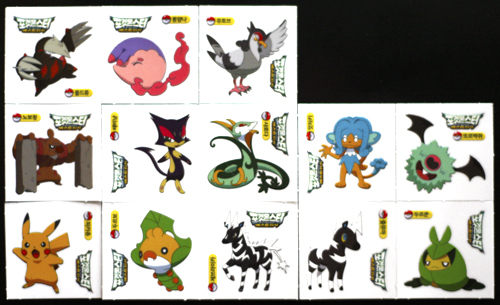 My brother is going to Japan next week and may drop by the pokecen if he can, and I'd like to know if he'll be able to find these there or if I should try to get them on the comm (is anyone selling these right now?) or from hardrockpkmn as a last resort.